Summary: This presentation is mainly for cotton growers, consultants, pest managers or advisors and plant pathologist not only in Oklahoma and Texas but all over the US where cotton is grown. Virus diseases in cotton have been reported worldwide and have caused tremendous losses in quality and quantity of cotton. Rather than waiting for a virus disease to establish in a cotton field, we need to be a step ahead of the disease and be ready for any virus disease epidemic to manage it in time. The emphasis of this work is to survey cotton fields in Oklahoma and Texas, collect cotton plants showing typical virus-like symptoms, develop robust diagnostic methods for virus disease (caused by either RNA or DNA viruses) of cotton and determine the prevalence of known or new viruses in cotton crops. This information will help us to determine the presence of virus inoculum and possible vectors in cotton fields. In addition, previous knowledge of a virus disease of cotton in a particular location will enable us to manage virus diseases much easier if it comes in epidemic form due to favorable conducive environment. Timely detection of a virus disease with the reliable serological and nucleic acid based diagnostic methods in cotton will avoid major yield losses of cotton crops. In conclusion, our long term goal is to protect cotton crops in the US from the effects and future epidemics of virus-like diseases and sustain high quality cotton production which is of paramount importance to the cotton industry. This presentation generally talks about the importance of virus diseases in cotton reported in the US and worldwide. By the end of this presentation, all the stakeholders should know about viruses infecting cotton, virus-like symptoms and their potential effects on cotton plants and yield. Based on the symptoms, stakeholder will be able to easily differentiate a virus-infected plant from a healthy cotton plant in cotton fields. About the Presenter: Dr. Akhtar Ali is an Associate Professor of Plant Virology in the Department of Biological Science, at the University of Tulsa, Oklahoma. He received his Bachelor of Science in Plant Pathology in 1984 and Master of Science in Plant Virology in 1988 from the University of Agriculture Peshawar, Pakistan. Later, he obtained his PhD in Plant Virology in 1999 from the University of Adelaide, Australia. Dr. Ali worked on various plants viruses as a postdoctoral fellow in Japan, Australia and USA respectively before he joined the University of Tulsa as a faculty in 2007. He also worked on Cotton bunchy top diseases during his second postdoctoral fellowship in Australia from 2002-2004. 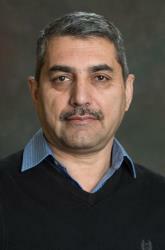 At the moment, Dr. Ali’ works on the ecology and characterization of viruses infecting cotton, legumes, cucurbits and wheat at the University of Tulsa. His cotton research program focuses on the identification of viruses infecting cotton, with emphasis on the development of a robust and reliable diagnostic method for cotton viruses.